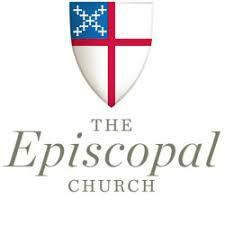 This sermon, “From Eco-Crucifixion to Eco-Resurrection,” was preached on Jan. 14, 2019, at Lexington Theological Seminary in Kentucky, where I am the Assistant Professor of Preaching and Worship. It was part of a service created and led by our LTS Green Task Force. Eco-resurrection. Poster created by Leah D. Schade. All rights reserved. During the first few days of our January intensives, students were invited to add an image to the Creation collage. It celebrates the blessings of God’s good Earth which sustains all life and gives us such beauty. 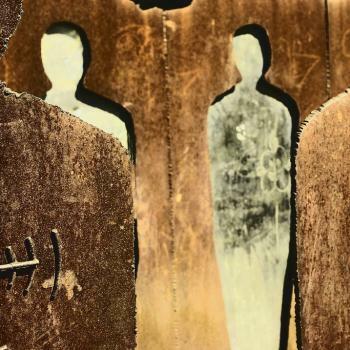 When students, faculty, and staff entered the worship space that day, however, they were asked to pick an image that drew their attention or called to them in some way. These are all ways in which humanity has poisoned, exploited, polluted, or destroyed God’s Creation. 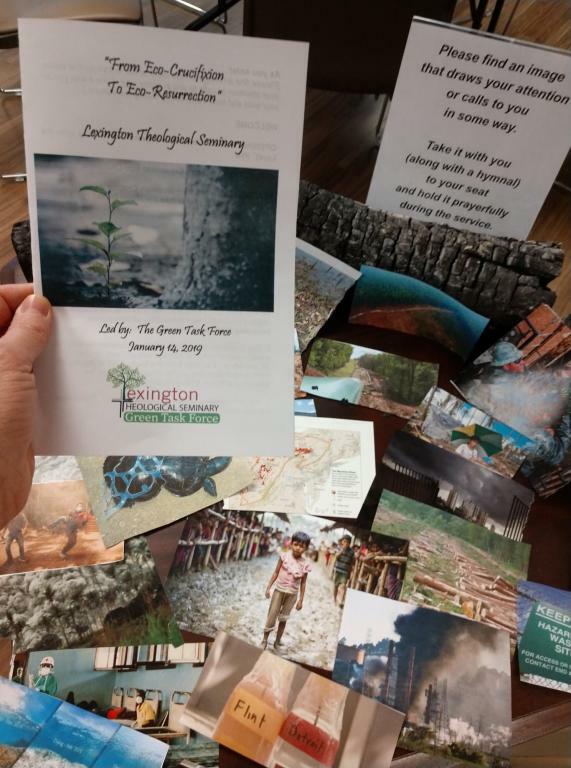 Worship bulletin and images of eco-crucifixion, Lexington Theological Seminary Green Task Force worship service. Photo credit: Leah D. Schade. All rights reserved. 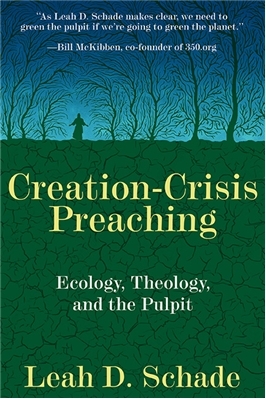 In my book, Creation-Crisis Preaching, I wrote about visiting a place called Hildacy Farm Natural Lands Trust located in Delaware County, Pennsylvania (a suburb of Philadelphia), where I used to live and serve as a pastor. It’s a 55-acre preserve that contains about 20 acres of woodlands and hedgerows and 30 acres of meadow. When my children Rachel and Benjamin were young children, I took them with me to visit this beautiful preserve. We listened to bull frogs calling to each other. We watched a Baltimore Oriole alight on a reed jutting up from the water. We ascended the path through the meadow watching a blue bird making a home in one of the nesting boxes. The path then took us down through a quiet stand of evergreens, where our footsteps were muffled by the carpet of fallen needles. When we came out at the bottom, we heard rushing water. We discovered, much to our delight, a waterfall cascading down from Springton Lake flowing into the rolling waters of Crum Creek. We followed the creek all the way along the path until we came back up along the other side of the meadow and returned to our starting point. 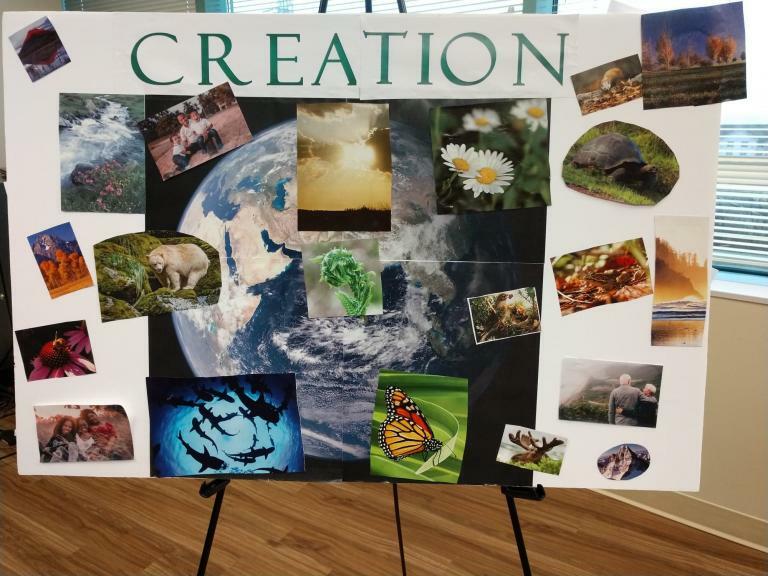 Creation poster. Photo credit: Leah D. Schade. All rights reserved. As we walked, I kept thinking of the Garden Paradise established by God for human beings described in the first two chapters of Genesis. It was like we had discovered a tiny Eden oasis right there in Marple Township. And yet from nearly every vantage point on the preserve, you can see houses and the passing cars on Rt. 252 looming above, and beyond that the shopping centers – all of it a grim reminder that the sanctity of this place is hemmed in by relentless human pressure on all sides. I knew that as soon as we got back in the car, we would drive through to the other side of the Eden story. The part of the story where the ground is cursed and human beings are engaged in constant battle with the Earth from which they were brought forth. 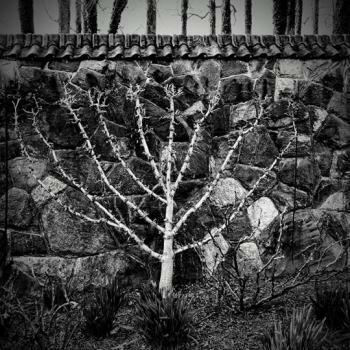 The story of humans taking from the tree of knowledge reminds us that God established boundaries that need to be respected. But we have done more than just violate the boundary. Look at the image you hold in your hand. These are all examples of ways in which we have decimated the entire garden of Earth. We are not just plucking fruit from the tree anymore. We’re cutting the whole tree down to make toilet paper and pave a parking lot! In the process, we are now at the brink of a global climate catastrophe and ecological collapse. 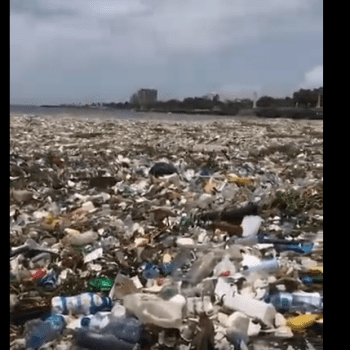 We are living with the consequences of what I call an eco-crucifixion. 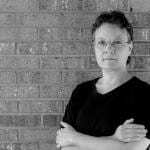 For what we do to Earth’s body, we do to God’s body (as Sallie McFague taught us), and we do to our own bodies – especially those bodies that are most vulnerable. 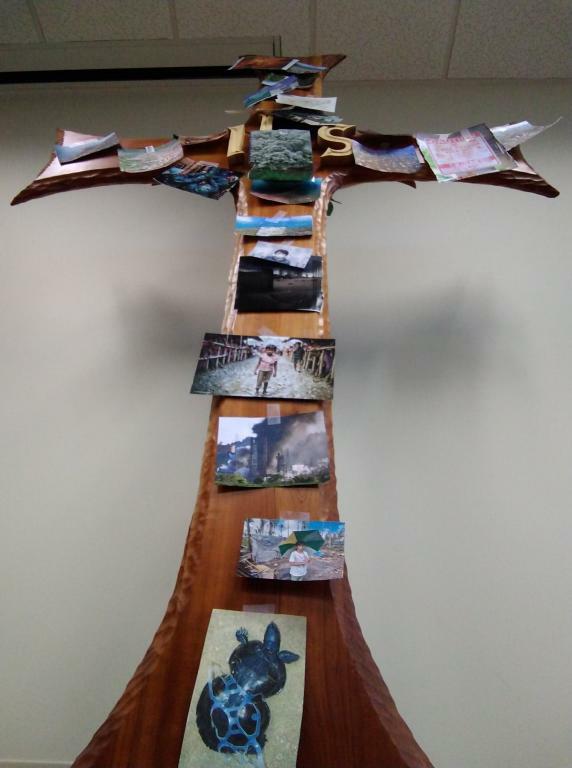 Eco-crucifixion, images affixed to cross at Lexington Theological Seminary. Photo credit: Leah D. Schade. All rights reserved. As you listen to selected readings from Jeremiah Chapter 2 read by members of our Green Task Force, I invite you to come forward with the image you chose and affix it to the cross. 7I brought you into a plentiful land to eat its fruits and its good things. 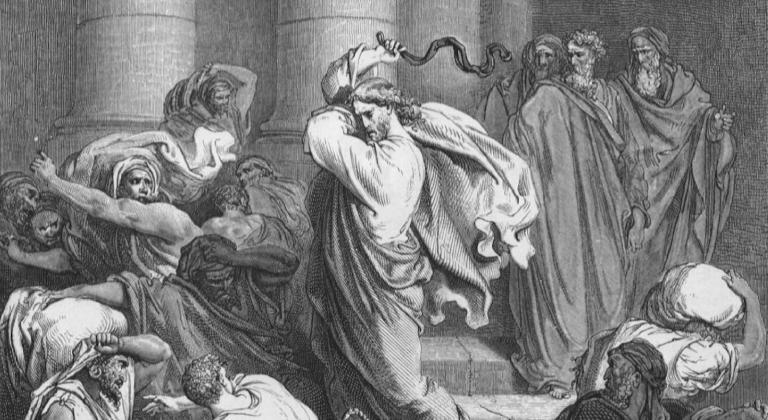 But when you entered you defiled my land, and made my heritage an abomination. 9Therefore once more I accuse you, says the Lord, and I accuse your children’s children. 12Be appalled, O heavens, at this, be shocked, be utterly desolate, says the Lord, 13for my people have committed two evils: they have forsaken me, the fountain of living water, and dug out cisterns for themselves, cracked cisterns that can hold no water. . . You have all rebelled against me, says the Lord. 34Also on your clothes is found the lifeblood of the innocent poor . . . Behold, the Lamb who was slain, who is slain, who continues to be slain. Eco-crucifixion. 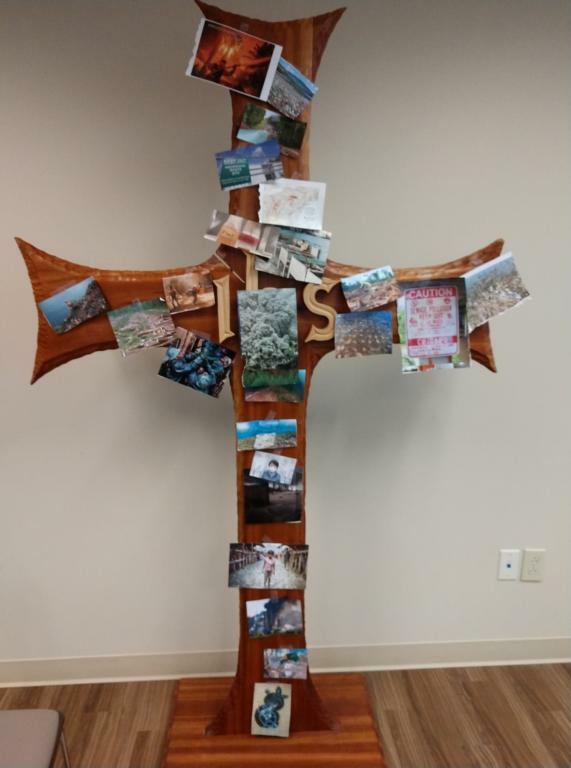 Images affixed to cross at Lexington Theological Seminary. Photo credit: Leah D. Schade. All rights reserved. Attend to those who need you most, O God. 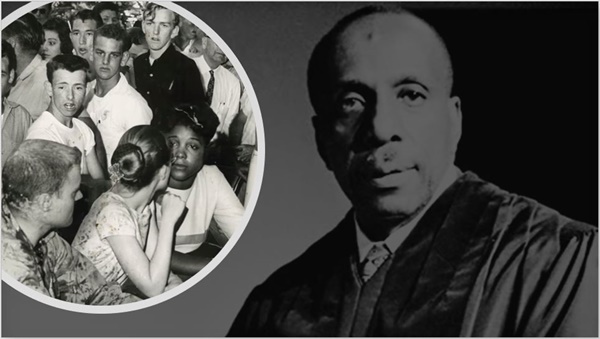 Move us to advocate and activate, pray and protest as we watch for your justice to rise up from below, descend from above, and blow across the Earth on the wings of your Spirit. In the name of the One who listens, cries, breathes, and activates along with us – Jesus Christ, Son of Earth. 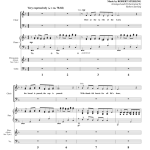 Yes – Jesus Christ, Son of Earth. For humans are children of Eve and Adam – whose name derives from adamah, the Hebrew word for soil. So Adam means “earth being,” “soil man.” Thus Jesus, son of Man is, by extension, Son of Earth. This is why I find the words in Matthew 12:40 to be so profound. Jesus says: “for three days and three nights the Son of Man will be in the heart of the earth,” (NRSV). The Greek phrase is en kardia ge, literally in the heart of the earth. The ancients understood the heart – “Kardia” – to be the center of physical, intellectual, and spiritual life. Such a phrase invites us to consider Earth as a living entity. So Jesus’ words here connect him to his earthy origins – as well as to the site where his resurrection will occur. It will happen within the heart of Earth, at the center of physical, intellectual, and spiritual life. 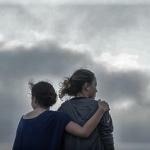 My friends – we are part of that physical, intellectual, and spiritual life. Because we, too, are children Eve and Adam, kin to Jesus, children of Earth. 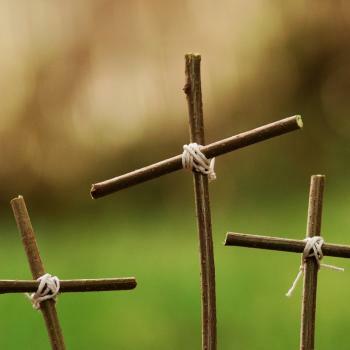 Led by the heart of Jesus into the heart of Earth, we are called to go to those places of the eco-crucifixion and tend to the broken bodies of people, communities, and Earth itself. 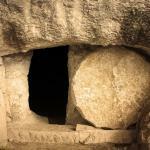 We are called to be witnesses and participants in God’s eco-resurrection. This eco-resurrection is happening across our planet. Compassionate, energized, creative, organized, and clever people are finding innovative ways to clean up the oceans, preserve threatened species, protest the construction of pipelines, and divest their denomination’s investment portfolios from fossil fuels. More and more religious leaders and congregations are establishing ecology ministries to promote environmental education, preserve natural habitats, advocate for environmental issues, and activate for climate justice. 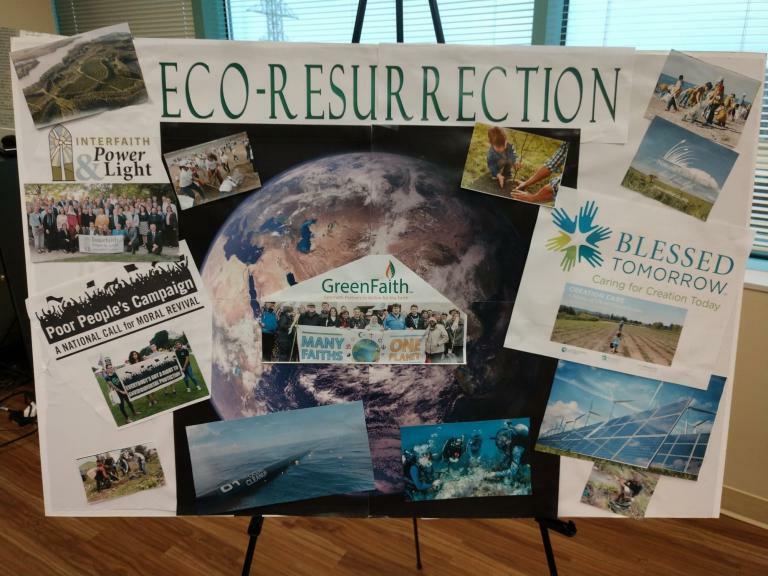 Organizations such as Greenfaith, Interfaith Power and Light, eco-America’s Blessed Tomorrow, and the Poor People’s Campaign are doing important work in God’s eco-resurrection. They are connecting people across interfaith chasms, building bridges across political divides, and uniting communities for this Great Work of our time. Even now, a group of bold legislators in Congress is proposing a Green New Deal that aims to address both economic inequality and climate disruption. So how about our own small community here at Lexington Theological Seminary? 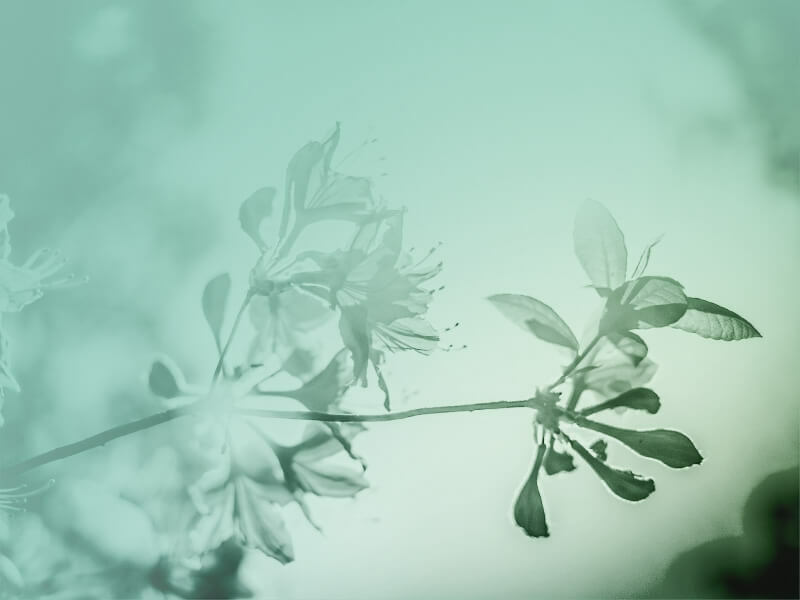 In what ways are we participating in God’s eco-resurrection? Our Green Task Force is an environmental coalition made up of faculty, staff, and students. Our motto is “Education, Sustainability, Community.” The team enables the institution to fulfill its mission of “preparing faithful leaders for the church and strengthening the church’s participation in God’s mission for the world” by attending to the ecological justice issues that affect ministry and God’s Creation. We work in areas of academic curriculum, worship, building and grounds, community life, and public ministry in order to “green” the seminary and holistically participate in God’s restoration of our planet. 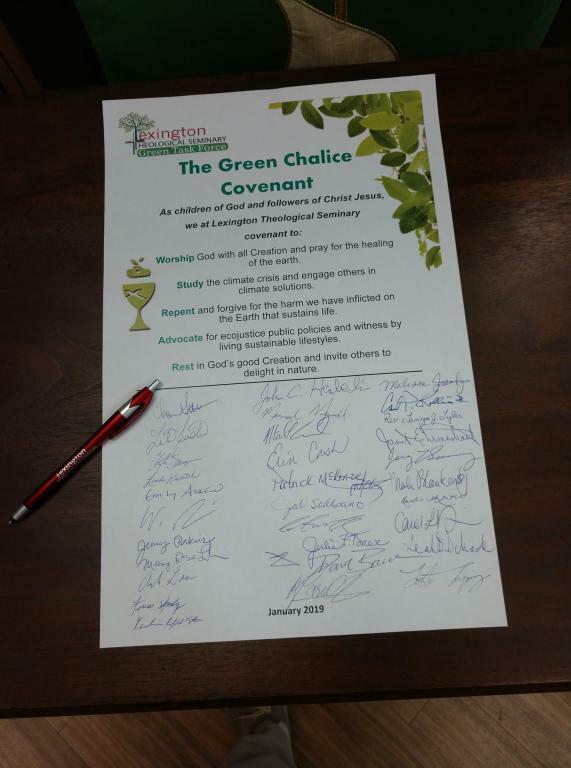 Students, faculty, staff, and administrators at Lexington Theological Seminary signed the Green Chalice Covenant on January 14, 2019. Today we are taking an important step forward by becoming a Green Chalice Seminary. 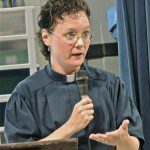 Green Chalice is organized under the Disciples of Christ Christian Church Home Missions, with the Rev. Carol Devine as its director, who is with us today. In a few minutes, we’ll all be invited to sign the Green Chalice Covenant, an event that recognizes the good work our seminary has already done to walk more gently on the earth. This good work includes serving Fair Trade tea and coffee; using cloth napkins and having meat-free options during meals at intensives. And in our curriculum, we offer several courses that focus on environmental theology, including courses taught by Dr. Emily Askew, an Appalachian immersion course I’ll be teaching during June intensives, and Wilson Dickinson’s course in July, “Jesus and Environmental Justice.” And Dean Martell is in talks with faculty to offer a continuing education certificate in environmental theology in the years ahead. And we’re also seeing eco-ministry as a means by which to reach out to our neighbors right here in Lexington Green office complex. 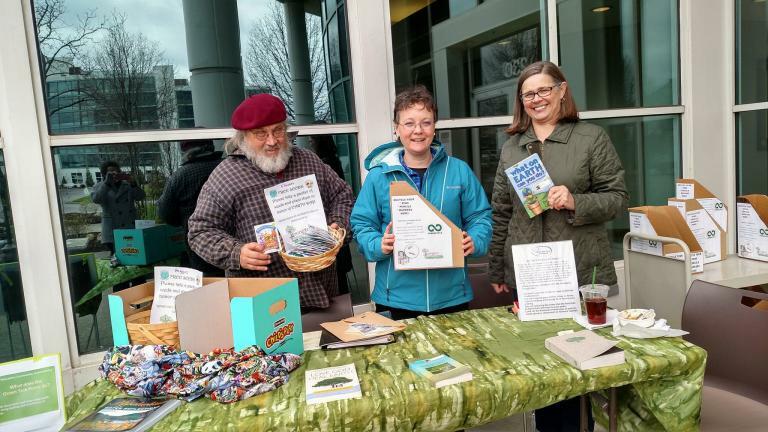 In April last year, we held an Earth Day event for the office buildings that included a local Kentucky Proud food truck, a table with free seed packets, and a pen/pencil/marker recycling effort. After the event, we visited offices suites in both buildings to give away more seeds and set up collection boxes for the pens throughout the buildings which will be sent to Terracycle to be turned into items such as park benches. So not only did we create a spirit of community in these two office buildings, the event raised awareness about how we can all contribute to a cleaner, healthier world. Members of the Green Task Force at Lexington Theological Seminary give out free seeds for Earth Day. So we are already taking steps in educating, building community and cultivating sustainability. 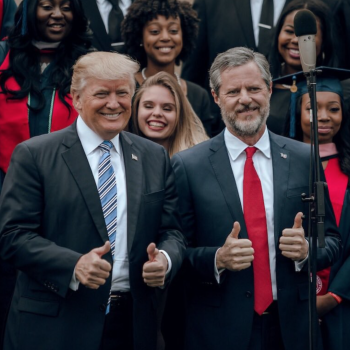 As we sign the Green Chalice Covenant, know that this is something that the LTS Board affirmed – indicating that this commitment is not just from a small group of people within the institution, but speaks to the values of the institution itself. Our next step is to become Green Chalice Certified which involves a deeper level of commitment in responding to God’s call to guard and protect creation. As we work on areas such as education, worship, outreach, and justice, we’ll continue to be leaders within God’s eco-resurrection. Our seminary, our students, our congregations can bring a word of hope, empowerment, and courage as we proclaim the eco-resurrection. I know that sometimes it seems that all we see is Earth’s crucified body crumpled and dying all around us. But as we stand with the women at the tomb of the crucified Earth looking at the enormous stone blocking our way, the biblical story reminds us that the Resurrected One is calling our name and opening our eyes to Creation transformed to new life. This calling urges us to return again and again to the biblical accounts of the resurrection to recover sacred memory and sacred courage. 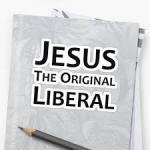 Remember how Jesus appeared: the same, yet different; transformed, yet with scars remaining. So, too, will be the resurrected Earth. Earth, too, will bear the scars. Nevertheless, God’s resurrection promise is that new life will emerge in ways that are sure to surprise us with God’s grace. The Divine One promises to meet us in our pain and transform our personal and planetary wounds into places of healing and new life. Amen. January 19, 2019 Hi, I'm Leah. I'm a Recovering Racist. 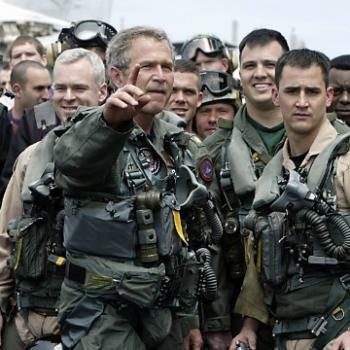 "I thought the Mueller Report exonerated Trump. Can you explain that please?"